I first encountered Michael Collins, owner of TSETA on an employment website for foreign teachers. From the beginning Michael was helpful in preparing me for the teaching position available. Many times I emailed him with questions on culture and work in Thailand. Michael was transparent in TSETA expectations, the dates, and hours required to by the school. Michael also walked me through the process of obtaining a work visa and teaching paperwork prior to arriving in Thailand. Read: Which TESOL Certification is Recommended for Thailand? Upon arrival, Michael picked me up at the airport in Bangkok and drove me to Suphanburi where I would be living. Both Michael and Supamas, the co-owner of TSETA helped me to set up an apartment in town. Any supplies like bedding that were left by previous teachers were distributed to new employees. I happily accepted basic home goods for my stay. Larger objects like cellphones and mopeds were available for rent from TSETA. Michael and Supamas often went beyond their obligations as a placement agency. They were a source of information for ongoing visa issues and would drive teachers, myself included, to appointments with visa officers. Michael and Supamas hosted a Christmas party for agency teachers. It was a wonderful way to celebrate the holiday with friends. They also liked to welcome new teachers to the agency by taking any available teachers out for a meal. The best part of teaching English with TSETA was the community of teachers that Michael and Supamas created. I never felt obligated to see other TSETA teachers socially, but developed long-term friendships with several of them. It was a comfort to know that this network was available. I maintain contact with Michael and Supamas because they were crucial to my positive experience as a teacher in Thailand. As supervisors they were supportive and as fellow teaches they were caring. I largely credit my successful transition as a teacher in Thailand to the team at TSETA. To aid in my transition back to teaching in the US, Michael wrote a letter of reference based on my employment with TSETA. I do not doubt that the experience and the letter were helpful in obtaining employment as a teacher in the U.S. within four months of leaving TSETA. 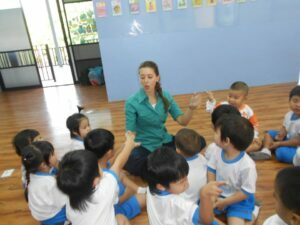 I recommend TSETA to any prospective English teacher looking for an authentic experience in Thailand.